Bún thịt nướng (bun thit nuong), or the even more glorious choice of, bún thịt nướng chả giò (bun thit nuong cha gio), is a Vietnamese dish, including rice vermicelli, grilled pork, Vietnamese pickles, scallions and their oil, fish sauce dressing, and finally a crispy fried spring roll. 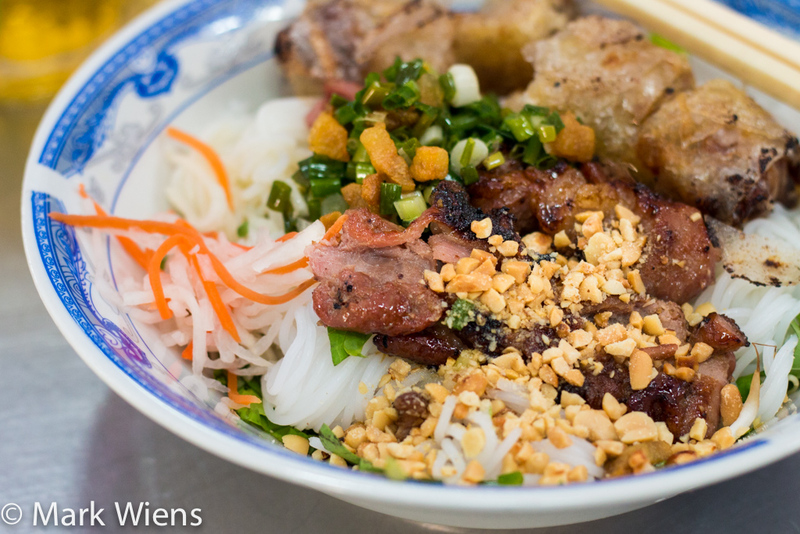 It’s one of many incredible Vietnamese dishes, something that I think is so good due to its contrast of flavors and textures, all combined into a single delicious bowl. 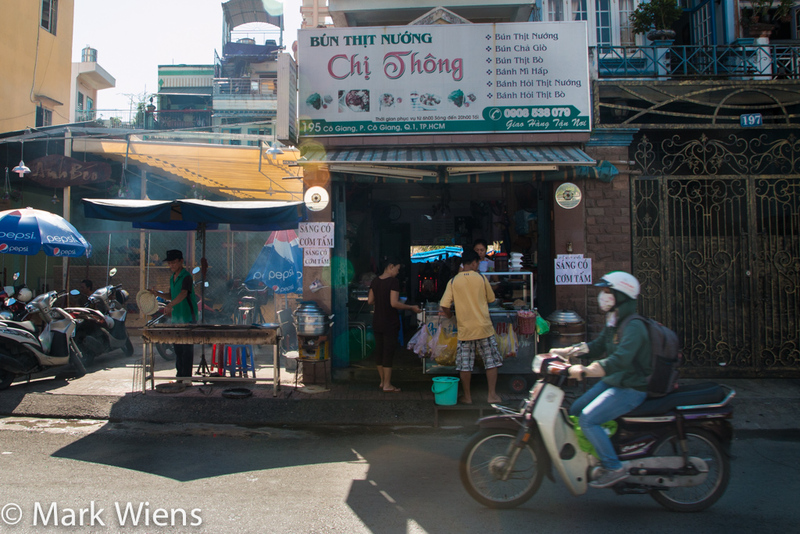 Recommended by both Eating Saigon and Jodi from Legal Nomads, one morning I took a stroll over to a restaurant called Chị Thông – Bún Thịt Nướng for breakfast. From the appearance of the outside, it had the characteristics – small, inviting, and friendly – of the type of restaurant, that in much of southeast Asia, you’re almost guaranteed to find a satisfying meal. I could immediately smell the sweet pork being grilled before I even arrived at the restaurant. The charcoal was blazing, and skewers of marinated pork were sizzling over the fire. The smell was unbearably good, and I had already mentally prepared myself for the feast. 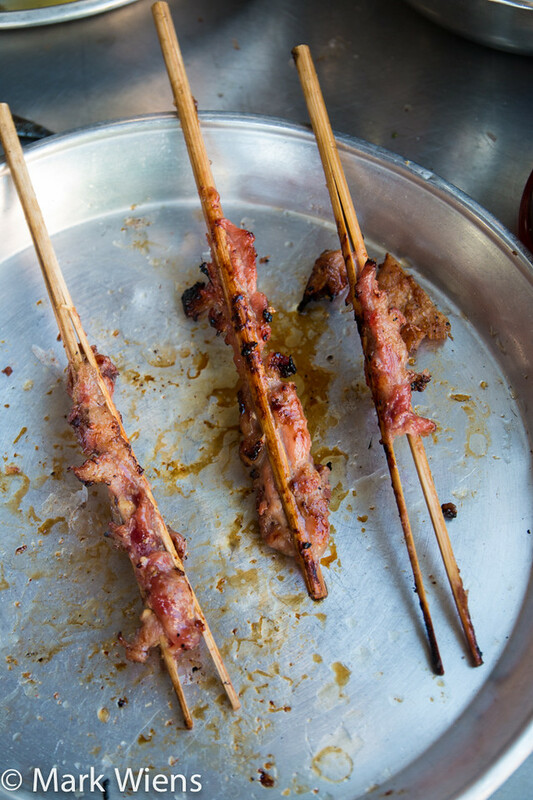 As soon as the pork was done grilling, the grill master would set the finished skewers of meat onto a serving platter, where they would be pulled from their skewers directly onto a bed of wiggly bún, rice vermicelli noodles. 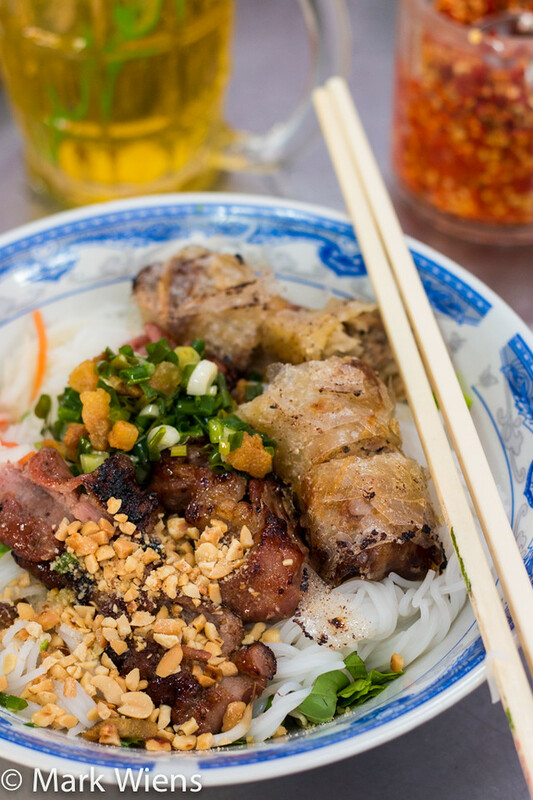 The difference between bun thit nuong, and bun thit nuong cha gio, is that the latter version includes a deep fried spring roll on top, in addition to the grilled pork. Not only does the cha gio add an extra flavor to the already delicious dish, but it also gives some crunchy texture to the soft noodles and other ingredients. I don’t think there’s any reason to not order a fried spring roll to top things off! Into the bowl, first went a handful of coarsely chopped herbs, I think I detected, Vietnamese coriander, sweet basil, and some lettuce. 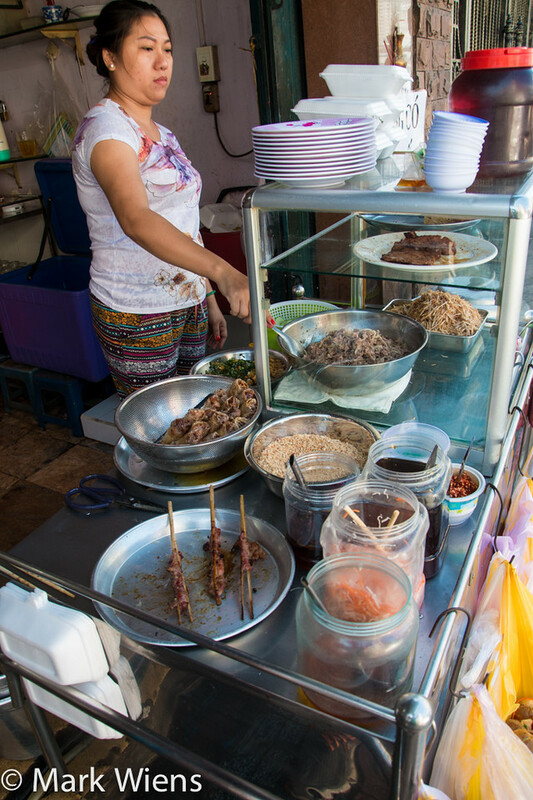 Then in went a handful of the sticky vermicelli, followed by two kebabs of sweet grilled pork, and a fried spring roll, sliced with a pair of scissors. Next, the noodles were garnished with scallions, that included some pork rinds and perhaps some pork oil, plus a scoop of Vietnamese pickles, a handful of peanuts, and finally a few scoops of sweet fish sauce, the dressing of any bún thịt nướng. I’m sure you already know by now, but to begin with, I ordered the standard bowl of bun thit nuong cha gio at Chị Thông (Chi Thong). The colors and presentation, was as beautiful as it always is, and it tasted as good as it looked. Although the dish isn’t ever served with chilies added, there’s almost always a bowl of crushed, half ground chilies that you can add yourself. A few scoops of chili into my bowl, and I was ready to start mixing up all the ingredients so everything was coated in the fish sauce dressing and peanuts. The pork was sweet and smokey, almost a little too sweet for me, yet still delicious. And the makeup of all the other ingredients was wonderful – the fresh herbs, the salty scallions, the nutty crushed peanuts, the sour and crisp carrot and daikon pickle, and finally that omni-crispy deep fried spring roll. 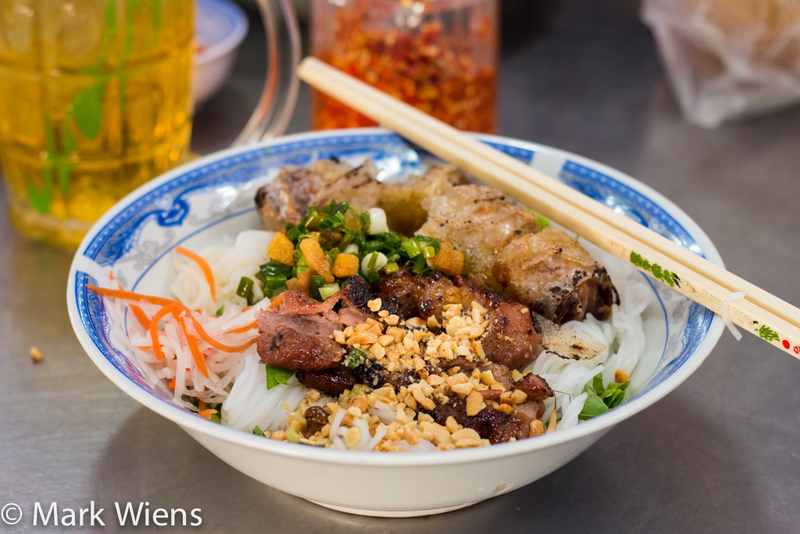 It was indeed a great bowl of bun thit nuong, and it made an extremely satisfying Vietnamese breakfast in Saigon. But we were not yet done eating. Having only a single deep fried spring roll in the bowl of noodles, that was just not enough, so we decided to order an extra plate of cha gio, which came on a little plate, including I think three rolls. 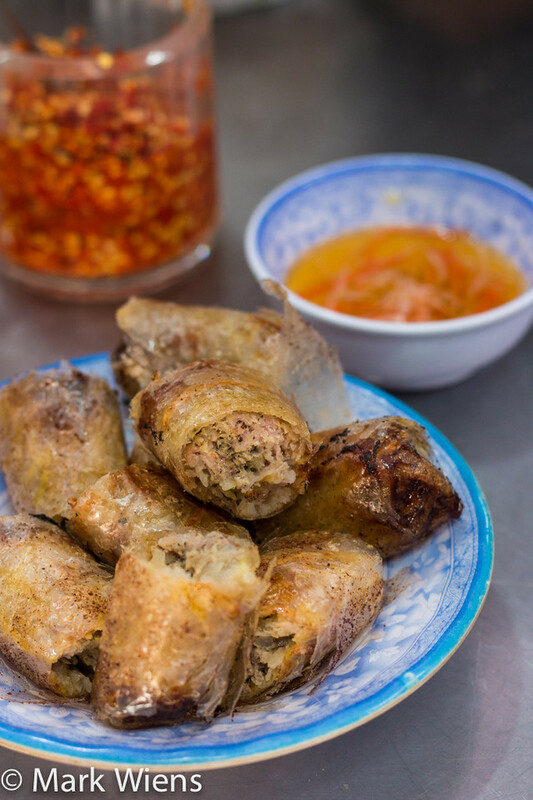 Wrapped in rice paper, then deep fried, the casing reminded me almost of baklava, micro thin layers of crispy dough. 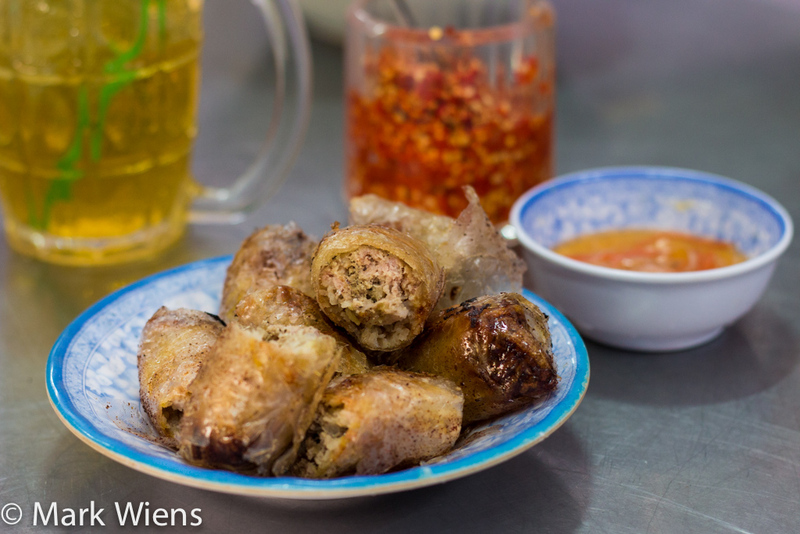 The fried spring rolls were, I think, filled with a mixture of minced meat, mung bean noodles, and perhaps some taro to make it creamy and hearty. They were big and packed with ingredients, and very good. 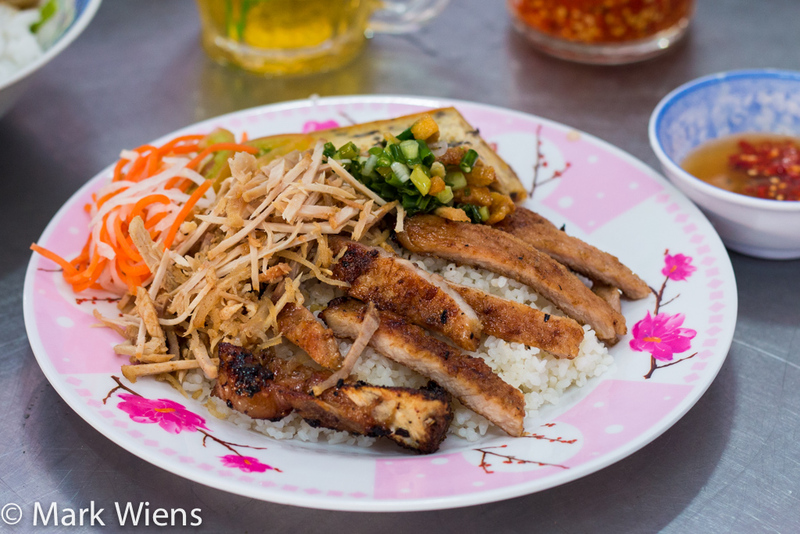 Finally, to ensure we had enough energy to keep walking around Saigon and doing as much sightseeing and running around as possible, we ordered a plate of com tam suon, the highly common southern Vietnamese dish of broken rice topped with a grilled pork chop. The meat, probably marinated in the same sweet soy sauce that the other pork was marinated in, was sweet and salty, and hot off the grill. Again, it came garnished with scallions and pork oil, Vietnamese pickles, a handful of shredded pork and skin, and a slice of Vietnamese meatloaf. Just like the bun thit nuong, the rice and pork was also delicious at Chị Thông. 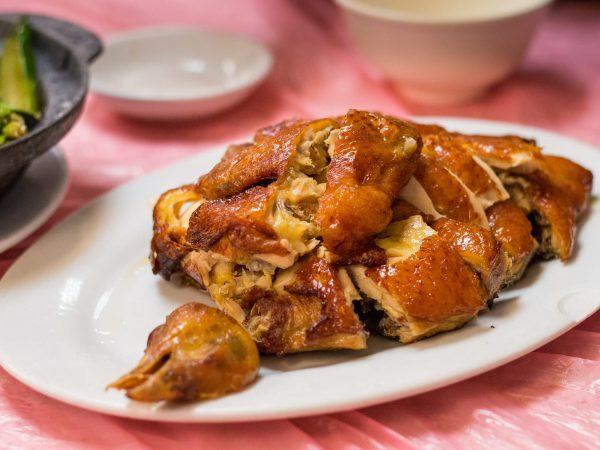 You’ll know you’re at Chị Thông – Bún Thịt Nướng by the noticibly purple paint job, the shiny stainless steel tables and chairs, and the wonderful smell of grilled pork outside the restaurant. Many customers also choose to order takeaway, so they can conveniently roll up on their motorbikes, grab their food, and continue on their way. There were three of us eating, myself, my wife, and her sister was also along with us for a few days during our trip to Saigon. 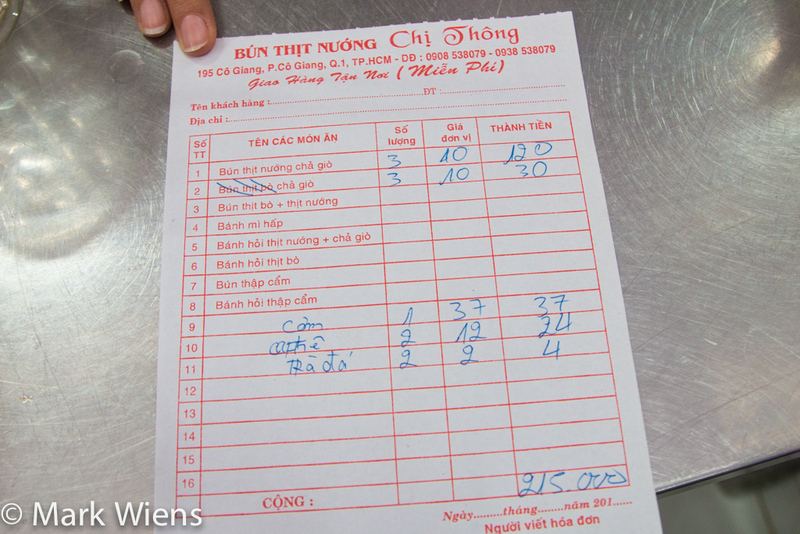 Our total bill came to 215,00 VND ($10.07) for three bowls of vermicelli, three extra fried egg rolls, a plate of rice and pork, and a few beverages. 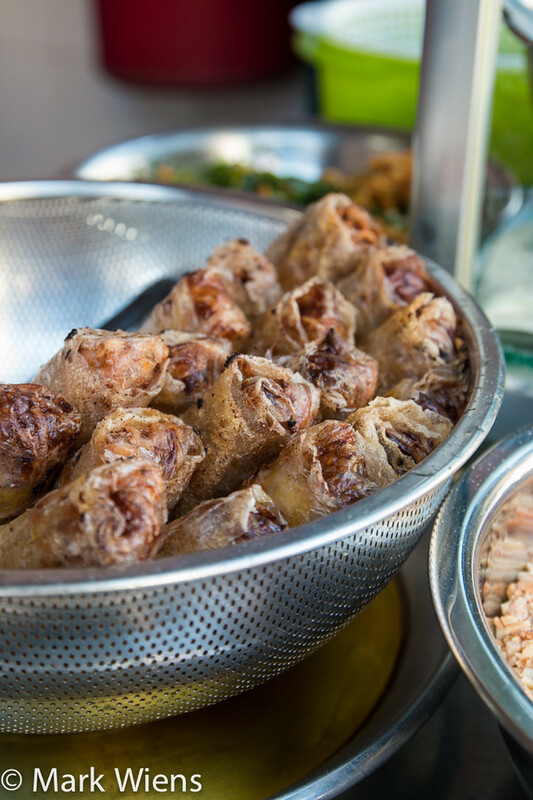 Bún thịt nướng is one of the many great Vietnamese foods, a dish of soft rice vermicelli noodles topped with grilled pork, Vietnamese pickles, scallions, and the choice of a chopped up fried spring roll. 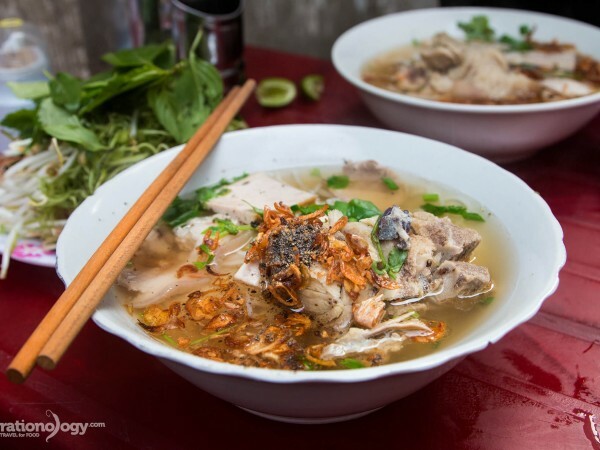 One of the many restaurants that serves this dish in Saigon (Ho Chi Minh City) is Chị Thông – Bún Thịt Nướng, where they not only serve a delicious bowl, but the owner is extremely friendly. How to get there: Chị Thông – Bún Thịt Nướng is located in District 1 of Saigon, not far from the famous backpacker area of Pham Ngu Lao or from central Ben Thanh Market. I walked from Pham Ngu Lao in about 15 minutes, but you could alternatively take a taxi to get there. From Tran Hung Dao main road, I turned on Ho Hao Hon, and walked down until I saw Co Giang street, made a left, and Chị Thông was on the right hand side of the road (see the map below for details on how to get there. Click “Chị Thông – Bún Thịt Nướng” on the map, and it should highlight it on the map for you). ugh, whoever introduced you these places must know Saigon like the back of his/her hands. Most of them are the best places for those dishes. Glad that you enjoyed your stay here. Its nice to see all your food blog.. Its makes me want to travel a lot and eat all those foods.. If you come to Indonesia maybe we can eat together. lol. Your killing me. I’ve visited Saigon/HCMC and my favorite memory is the flavor of the broth used for the Pho. It is amazing how they can make it with such subtle and bold flavors all at the same time. I’m a Pho junkie. Seeing and reading your articles reminds me of my visit and makes me yearn to return. Impressive how reading about your food adventures invokes so many emotions. Good job and thank you! Hey Kwong, thank you very much, and so glad that you love Vietnamese food and especially pho. There are some serious masters of flavor in Vietnam, that’s for sure. Thank you and hope you can return again for some more delicious food. 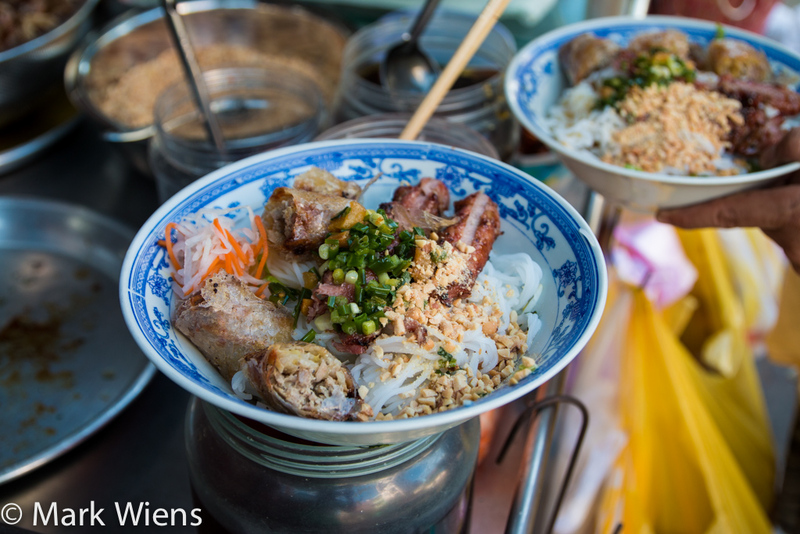 I can’t wait to go to Vietnam to taste all of these delicious food cuisines, reading this blog has just made me more hungry. Thank you Sigurdur, I think you’ll really enjoy the food in Vietnam. Oh my that food looks so amazing and for the price looks like an excellent deal. Excellent choice of venue Mark, this bowl of soup looks heavenly, I can almost taste the soft texture of the noodles along with the rest of the condiments, broth and meat the photo’s looks great, good enough to eat. I am waiting for the day with we get Smell a vision, otherwise I feel like eating my screen. Thank you so much Nash! Gotta love Vietnamese food. My third favorite following Korean and #1 Thai! Mark, Do you find the spiciness hotter than what you could get in the States? Most restaurants are pretty mild here. Hey John, those are some good top food choices. I don’t have too much experience about Vietnamese food in the States, but overall I didn’t really find the food spicy at all in Vietnam, although they always had chilies and chili sauce available at your table. Excellent choice, Mark. 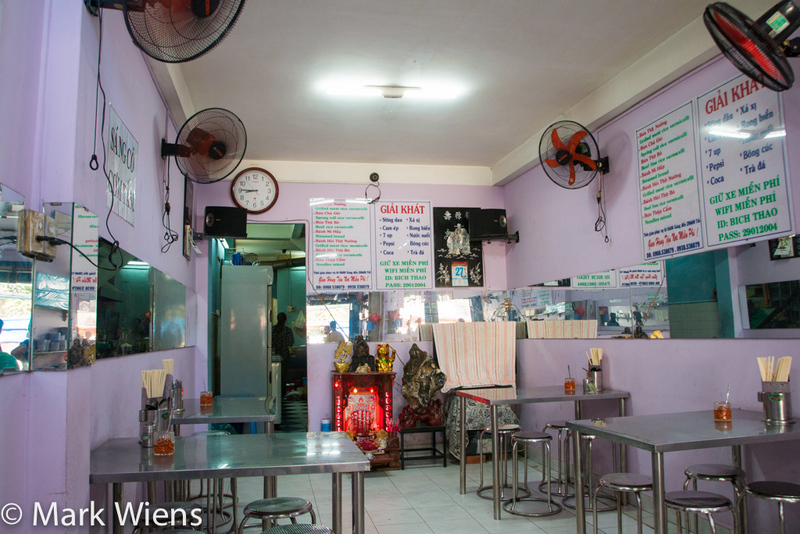 This place was a bit removed from our neck of the woods in HCMC, but it is well worth the effort to visit because it really is one of the best bun thit nuong’s in the city. They also have this dish that I’ve not seen anywhere else (though surely it can be found other places, it’s just less common) called Banh Mi Hap, which involves thin slices of grilled beef on soft french bread that you roll up in lettuce with herbs. It’s much less sweet than the Vietnamese pork and really delicious too! Hey Steph, great to hear from you. 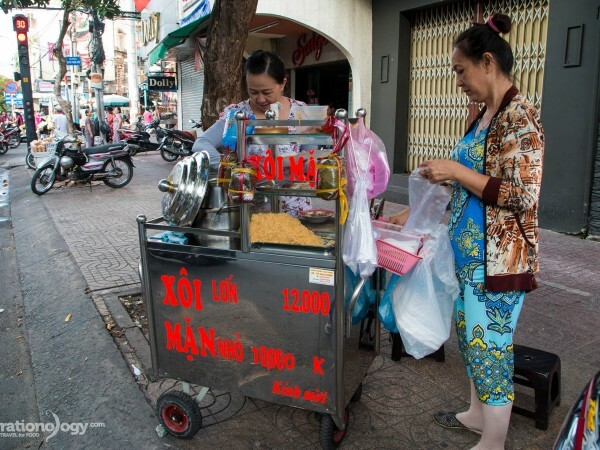 Thank you for sharing about banh mi hap, that sounds delicious, I need to go back and try that! Thank you for sharing. Out of all the cuisines we’ve sampled so far, we miss Vietnamese the most. We can’t wait to get back there next year to eat our way through the country again! We’ll definitely be checking this place out. Did you make it to Hoi An at all? Thank you Andrea, glad you love Vietnamese food so much. No, I wasn’t able to make it to Hoi An, but I’d love to go in the future. So amazing ! I hope the writer could come to Hanoi to do Hanoi scooter food tours with us and write an great article like this one ! Thanks for your excellent article and i wanted to fly to Ho Chi Minh city to taste it after reading your article. 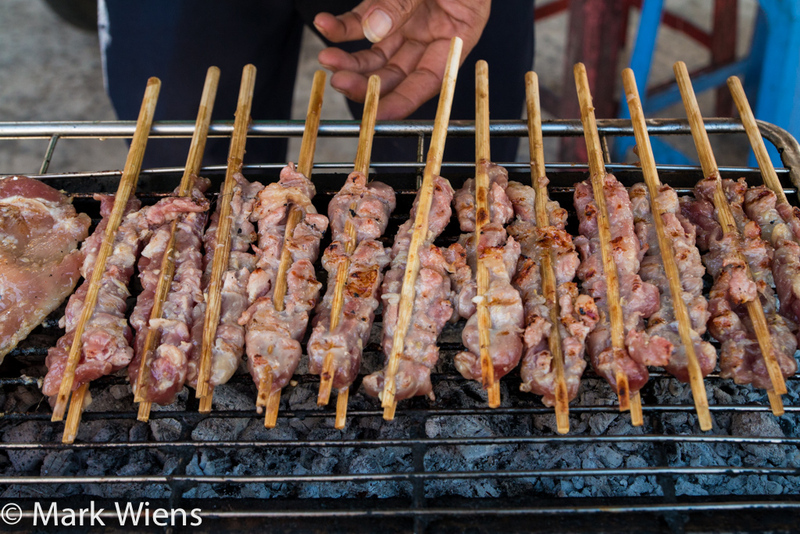 I think I have to go back to Vietnam soon – just to eat! Lovely blog btw! 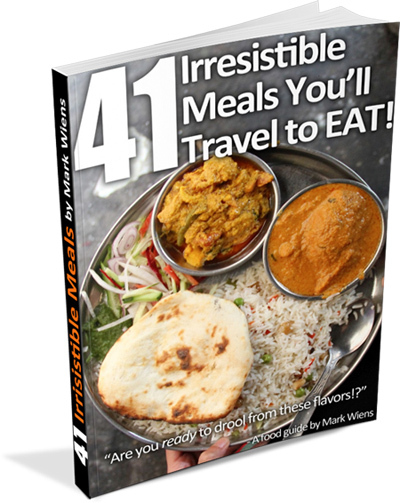 I really appreciate all the great restaurant tips from different places around the world! That’s a good reason to visit Vietnam, Marcus. Thanks a lot! Your blog always makes me hungry. Such great food discoveries. Love the photos! Thank you very much Renuka.